Sometimes I just want to sew. Doesn’t really matter what. I decided that I would start a project that I can easily put away and go to whenever I want something to work on. I have a quilt kit called Spring Bouquet. All of the applique pieces are laser cut and pre-fused. How awesome is that! I cut the blocks and am starting the fusing process. Since the blocks are large, I plan to hang them from a pants hanger or use clothes pins. The blocks will stay nice and neat and whenever I get in the mood….I’ll just work on stitching down the applique! I bought (ok, yes expensive, but beautiful and it was on sale, and….) silk thread that I will keep all together with a bobbin full of Bottom Line. I love this thread. I originally learned about it as a thread to use in the bobbin for machine embroidery. It is a 60wt poly thread, which makes it perfect for using in the bobbin when sewing decorative stitches. I have found that using grey means you don’t need to switch out your bobbin when you change your top thread color. I have both a dark and light grey so I’m ready for any color of fabric. Yes, I also have white and black, oh and cream. If you come from the school of cotton only thread, please ignore the following statement. I have also used this thread when quilting in the ditch. (sinking the quilting threads into the seam). I’m excited. I like the idea of having something to go to while having the freedom of working on whatever else may strike my fancy. I started writing this post before I finished fusing the first block. There’s 9 blocks and over 6 yards of borders. It might take me all year to finish and I’m sure I’ll get sick of it now and then.Who am I kidding, I’ll be lucky if I get it done this year. Don’t get me wrong, I love this pattern and the finished quilt will be amazing, even if I screw it up. And believe me, if there’s a way to screw it up, I’ll figure it out. 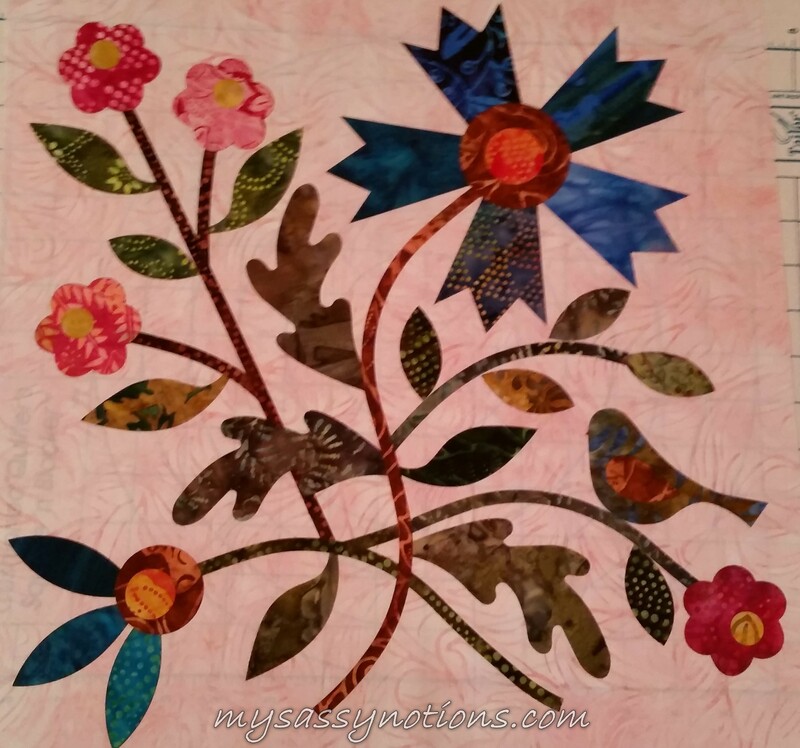 This entry was posted on January 15, 2015, in Quilting and tagged applique, Bottom Line, Laudry Basket Quilts, quilt kits, Spring Bouquet. Bookmark the permalink.